Webm is a video file format used extensively for the use in a HTML5 video. Webm is believed to be built for the web consisting of VP8 video codec (video technology). Also it delivers better quality videos than any other video format, resulting in a beautifully crisp and clear visual experience. Not only is the quality of the streaming jaw-dropping, but it also does not need high storage and can even work flawlessly on lower storage system. 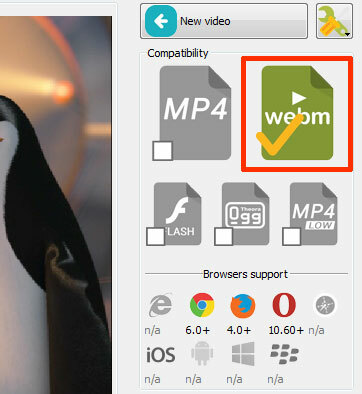 A webm format can be played by a supporting media player or a web browser. In fact, even YouTube is now supporting videos that can be streamed in the WebM format, making it a truly futuristic experience. When it comes to personal use, you might be thinking “how do I convert a video in a webm format?” The answer is simple; there are many software’s available on the internet that are free of cost and support the webm. One of the finest WebM converters include EasyHTML5Video converter, about which you can read below. While the benefits of the WebM may have won your hearts, you should keep in mind that the playback performance is not yet fully optimized and there is scope for improvements in the future. For converting a video file like MP4 into webm, softwares like Firefogg Firefox extension and Miro Video converter pop up if you want a quick convert from MP4 to webm. However, there are many other converters that are better alternatives and can provide high quality conversions; one of the most trusted and efficient converter is EasyHTML5Video converter. All you have to do to get started is drag and drop the files, set poster image, select codecs, tune settings and just hit “start”. EasyHTML5Video is a revolutionary step in the industry of webm programming, enabling and discovering new opportunities, enhanced features and optimum results. It really gives you that wow moment! When it comes to choosing the right converter for the job, you really need to do your homework right. There are plenty of converters available that can do the job, but only a handful that can do the right job. EasyHTML5Video is a tool that guarantees satisfaction and best possible results. It’s easy to understand functionality makes it one of the finest converters present in the market for the purpose of WebM conversion. It is evident that Easy HTML5 Video converter delivers what it is known for- Quality rich content.